For the next 31 days, there will be free entry to seven museums in August for Singaporeans and permanent residents in Singapore. 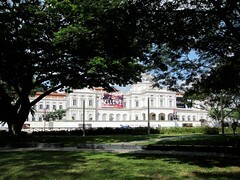 In addition, the museums will be opened free of charge to all everyone (tourist and foreign talents) on National Day (9 August 2011) and Hari Raya Puasa (30 August 2011). The museums are: The Asian Civilisations Museum, the National Museum of Singapore, the Singapore Art Museum, the Singapore Philatelic Museum, the Peranakan Museum, Memories at Old Ford Factory, and Reflections at Bukit Chandu.